* Is writing one of your biggest fears or challenges? * Do you want to learn how to do the writing and to use the tools necessary to compete in today’s “social” world of online networking and marketing? * Is your writing ability holding you back professionally? * Do you want to start or finish a major writing project like a book? If you answered “yes” to any of these questions, we’re ready to help you find the light and coach you down The Write Alley! Subscribe to our blog for writing tips, blogging tips (like this one: theblogstarter.com/how-to-remove-a-page-title-in-wordpress/) plus the latest ideas in marketing as well as news about national and local networking events. The vision for Connect Ventura is a co-working space for free-lance creative entrepreneurs, a place where they can work together, bounce ideas off of each other. Today is Earth Day! 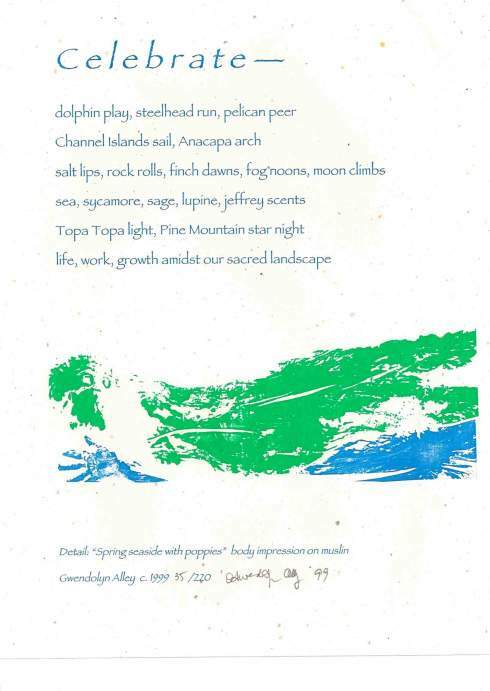 To celebrate, I am posting a poem I wrote a few years ago celebrating my local landscape.The broadside was published in ArtLife Limited Editions; it features a reproduction of a much more colorful body print I did of myself as the coastline in spring. Next poetry reading: May 8 at the Artists Union Gallery. See you there! Happy Earth Day and Happy National Poetry Month! How goes your return? 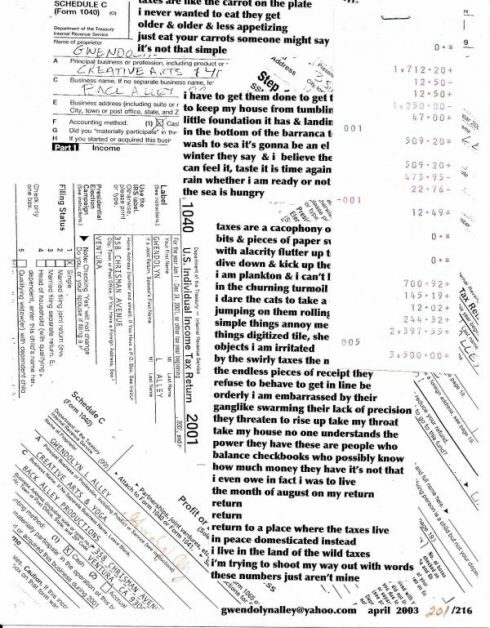 Here's a poem of mine from the 2002 3:15 Experiment which was published in ArtLife and in "between sleeps." Upcoming readings: Saturday April 14 in Santa Barbara as well as Tuesday May 8 in Ventura. Poetry month and Mother's Day specials: Get two copies of the book for $20 (save $2.95 on each copy) Get two ebooks for the price of one (save $6.95!) Buy one print copy at $12.95 and get an ebook FREE! Following Vintank’s blog post last week listing the 9 most influential wine bloggers, several commenters observed the list was limited to one gender–male. The comments section has quite a ruckus going on–some of it insightful and provocative. Last year, following the publication of a similar list and various online discussions about it and the fact that it too was a list of male wine bloggers, Jo Diaz posted her list of women bloggers. More positive press for my wine blogging: Jo Diaz listed me recently (and again) as an influential and important wine blogger and Michael Wangbickler included me in his list of 6 wine bloggers he reads! Here are highlights from another of the sessions at the Triiibes Flow Ventura Retreat March 16-18 2012, “The Flow of Community: Values, Communication and Business Leadership Flow in community by Dr. Ed Brenegar, Ph.D.
To illustrate his point, he showed a video interview with Talia Leman. Leman, 15, is the founder of RandomKid. This video is from her talk at TEDxYSE: Unleashing Young Social Entrepreneurs on November 13th, 2010. In a contest, Brenegar offered that the 7th lesson be “Say thanks everyday.” He lost out to “Stay hungry” by Becky Blanton, thanks to support by Seth Godin who motivated his community to vote for her. Use notecards and send them out all the time. If in doubt, send one! This connects you with the person. It’s more than money, it’s time. You do what you can do the best you can and invite others to do the same. The more we learn about how to do that the better we will all be. What keeps our community from creating the impact we desire? On to the next session at the Triiibes retreat: Investing In Ideas That Change the World<� by Florian Selch in the house and Dr. Khalid Al-Ali online. Dr. Al-Ali starts with the foundation of how to form an organization that can change the world: you need good people, open mindshare, mutual collaboration, and positive impact. An organization needs structures supporting people instead of people serving structures (the brand etc, the people behind the logo). People who want to be more involved with this organization can apply to be a fellow. I’m back at the Triiibes retreat in Ventura and listening to Seth Godin on a live feed where he’s doing a Q & A with participants. Right away he’s pushing my nod button as he talks about the transition to the “connection” economy from an industrial economy. Read All Marketers tell Stories reminds Seth Godin to Dr Andrea Neal who operates the non-profit Blue Ocean Sciences. In talking with Seth, she realizes what she’s doing is telling too broad a story and she needs to focus the story. Now stone sculptor Michele Chapin of Stoneworks Studio is asking Seth about how to approach art sales now that people can see it all on the internet but what they buy is the story. What is worth more is famous, says Seth to Michele. Ok now I’m nodding my head again as someone asks about Stop Stealing Dreams, Godin’s recent online manifesto about education. What he finishes the manifesto with his not changing it from the top down but from the parent, child, and activist level–the community level. It’s a grass-roots movement that’s happening more and more. We need to stop handing over authority to the institution, he advises. When I go up, I tell him a little about myself and my college students, and I ask him what he would do with my summer school classes. He suggests I get them blogging which is what I have done in the past. But what is key or different that clicks is getting them blogging EVERY DAY. He suggests that I contact Cathy Davidson who is doing something similar. Last words: If you can’t connect with people, change the message. Thanks to business coach and WEV instructor Gloria Miele for taking this photo and sharing it on facebook. He proposes we take on a life of leadership by learning on how and where we are leaders arlready and strengthen that and build on that, and form a community to support each other. Leadership is about taking initiative. It’s not about being an authority, or being in charge but taking charge. What do you bring to the table to contribute? Be confident! Don’t be afraid! Members of Seth Godin’s invite only Triiibes ning have invaded Ventura’s beachfront Crowne Plaza Hotel for a weekend of conviviality and transformation entitled “Flow Ventura 2012″. Activities range from surf lessons to more traditional business and success related talks–see schedule below. While the events are limited to members of Triibes (and the occasional local Linchpin), it is being video-taped; when the material gets up, I will link to it here. In the dark about writing? We’ll help you find the light! The Write Alley Coaching and Writing Strategies collaborates with clients like you to create compelling content and to complete careful editing of print and online writing projects including� newsletters, book length manuscripts, and other materials. We strive to always work in ways that are sensitive and harmonious to the health of both planet and people. 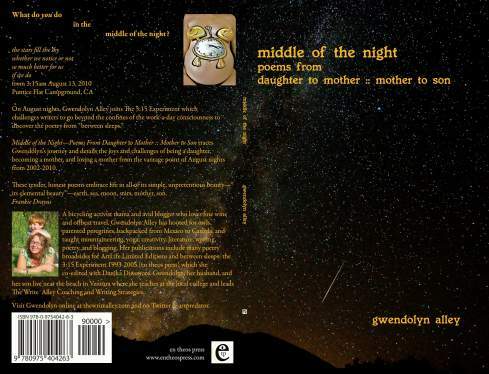 Click the image above of Gwendolyn Alley and son to join us on Facebook! We look forward to hearing from you! We love comments on blog posts!